Ichiro Suzuki, overrated or one-dimensional? We have a friend who is a huge Mariners’ fan who hated Ichiro Suzuki as a player. He kept telling us Ichiro was overrated and he was part of the reason the Mariners sucked offensively. His gripe was that for a guy with speed, Ichiro didn’t use his speed and was a very passive baserunner for a guy who stole 30+ bases a year, who often didn’t take an extra base when he maybe could’ve nor did he come home on shallow flies when he likely could have scored. And that Ichiro didn’t do a lot of the little things to help the Mariners win, like move guys over or hit sac flies, etc. I decided to take a look at Ichiro’s stats, and I found out, he does put up some very weird (and even freakish in some ways) numbers. I don’t think I would use the word “overrated,” but “one dimensional.” Ichiro is a very good example of how batting average is a very overrated statistic. Ichiro started in MLB at the age of 27, but he will easily get to 3,000 hits. He has also won numerous Gold Gloves, steals a lot of bases, is the best Japanese-born player in the history of baseball and will easily and deservedly make the Hall of Fame on his first ballot, but he is also a very good example of how batting average isn’t the most important statistic. Ichiro is the anti-Moneyball. Plainly put, Ichiro is a lifetime .322 hitter, but he doesn’t do nearly as much damage offensively, especially for a leadoff hitter (though he doesn’t bat leadoff anymore, but did bat leadoff for the bulk of his career), as you would think — for two reasons. 1) He doesn’t hit extra base hits and 2) he doesn’t walk. For a .322 hitter, his on-base percentage is an above-average but unspectacular .365. For an example of how “meh” .365 is … that is ranked No. 348 all time in MLB history. Ichiro’s career on-base percentage is lower than guys like Steve Kemp, Mickey Tettleton, Phil Bradley, Jeff Cirillo, John Jaha and Brian Downing. It’s even lower than Adam Dunn’s on-base percentage. Yeah, that Adam Dunn, the guy that bats .200 every year. In Ichiro’s rookie season in 2001, he was second in the AL in runs scored, but since then, he has never finished higher than 6th and has not been in the top 10 in runs scored since 2008. This is a guy who averages 670 at-bats a year and 215 hits a year hitting leadoff … never higher than 6th in in the AL in runs scored since 2001. That pedestrian on-base percentage is part of the reason. His preponderance of singles is the other. The other odd thing is, Ichiro does have power. He averages just under 9 home runs a year, which is decent for a leadoff hitter. But, he doesn’t hit doubles hardly at all, and he doesn’t hit a lot of triples for a guy with so much speed (about 6.5 triples a year). He simply seems content to slap the ball through the infield for easy singles. It means he has a really high batting average, but he isn’t doing that much harm to the other team. Let’s compare Ichiro to other Hall of Fame leadoff hitters. I should stress that these are SINGLES hitters. Guys that didn’t hit a lot of home runs. But you can see that other than one guy, Ichiro’s numbers are not as good, when you add on-base percentage, slugging percentage and OPS (On base + slugging). Again, to reiterate, none of these players are home runs hitters and they batted leadoff for much of their careers. Wade Boggs is the best of this bunch. An incredible hitter who walked more than 87 times 9 times in his career. He also hit more than 40 doubles eight times (playing in Fenway helped). Tony Gwynn didn’t walk that much, but hit more than 760 extra-base hits. Pete Rose hit 40 or more doubles 7 times and walked 86 or more times 6 times (and his OPS numbers declined dramatically his last five years in baseball because he hung around until his mid 40s trying to catch Ty Cobb’s hit total — Rose only hit 6 home runs in his final 7 seasons, which really hurt his overall career OPS.). Lou Brock played in a deadball era in the 60s and early 70s and didn’t have an especially great batting average (.293), 29 points lower than Ichiro’s. Ichiro has never hit 40 doubles, in fact, he’s never once even hit 35. He average 25.6 doubles a year and 41 extra base hits a year (Ichiro will assuredly get to 3,000 hits, but will barely crack 400 doubles — Craig Biggio has more than 600 doubles and Pete Rose more than 700). This is from a guy who averages an astonishing 670 at bats a year (and that is a freakish number), so that means Ichiro is hitting an extra base hit (double, triple or home run) about once every 16 ABs. Roughly … twice a week. 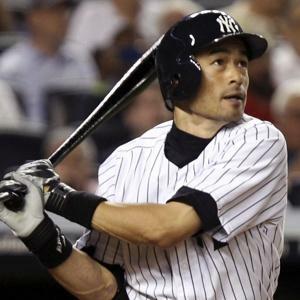 Ichiro also averages 43 walks a year and has only walked more than 51 times once in his career. This is a leadoff guy, whose job it is to get on base. Let’s look at Ichiro’s numbers now compared to some other good leadoff hitters, some of whom didn’t hit for average. Guys that walked and hit with some power (ie, did a lot of damage offensively). Rickey Henderson wasn’t an especially great hitter (.279 career), but he walked an incredible amount (16 seasons 80 or more walks) and hit with power, and thus caused a lot more damage than Ichiro, as weird as he was as a player. Biggio for a .281 lifetime hitter scored an incredible number of runs (6 times 113 or more runs). Some of that was because of Jeff Bagwell hitting a ton or home runs behind him, but some of that was because Biggio hit more than 1,000 extra-base hits. By comparison, Ichiro has 492 extra-base hits. Here’s Ichiro’s weaknesses illustrated. Look at these numbers. Difference between batting average and on-base percentage and percentage of hits that are singles. None of these players are even especially close to Ichiro. Wow, a whopping 81.1 percent of the time Ichiro gets a hit, it’s a single. None of these other players are even close. Only 18.9 percent of his hits are a double, triple or home run. So, our friend had a point. Ichiro was likely part of the reason the Mariners were not a good offensive team the last few years. He fits a style of baseball that appeared prevalent in the 1880s, and probably fit Japan well, but in modern American baseball, he seems out of place. What I would call Ichiro is the greatest singles hitter in Major League Baseball since maybe Wee Willy Keeler. But, I would take Wade Boggs, Paul Molitor or even Craig Biggio as my leadoff hitter over Ichiro any day. A few months ago, I wrote an article about four players who conceivably could get to 300 wins (after Michael Wilbon and Tony Kornheiser said it was IMPOSSIBLE — IMPOSSIBLE — for any player today to get to 300 wins). The four I mentioned were CC Sabathia (191 wins, age 32), Justin Verlander (125 wins, age 29), Roy Halladay (199 wins, age 36) and Mark Beurhle (174 wins, age 34). There were two guys I should have mentioned. I missed them because they both had way more wins than I realised. The first is Tim Hudson. I can be forgiven for forgetting him, because he had a six-year stretch in which he only won 68 games. But, in the last three years, Hudson has won 49 games (16.3 wins a year) and sits at 197 wins at the age of 37, within range of 300. Hudson has won 16 or more games 8 times, so he is a workshorse. He would have to average about another 17 wins a year for the next six years (retiring at age 42) or he would have to average 14.8 wins for another seven years (retiring at age 43). He is a longshot to get to 300, but he is pitching for a good team in Atlanta and has been healthy for four years, so it is not impossible. In fact, I would say Hudson has a better chance than Halladay, who appears to be injured and breaking down. 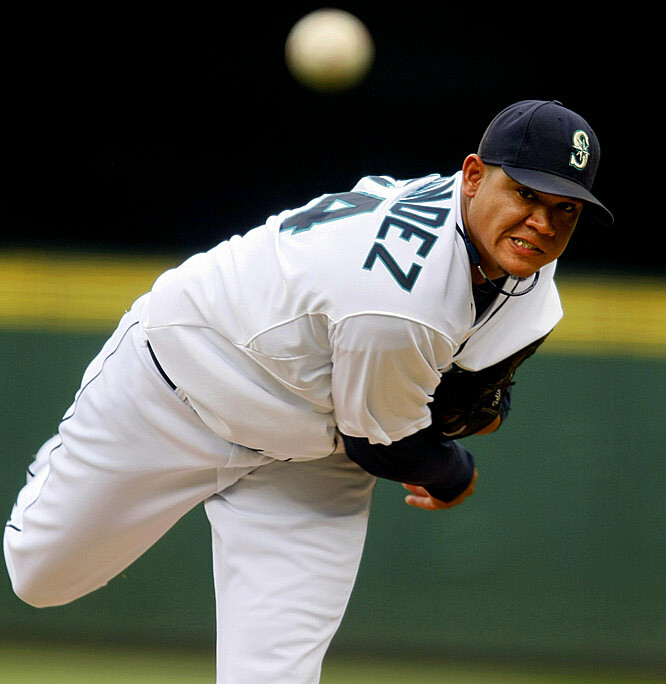 The other pitcher I should have mentioned is Felix Hernandez. Hernandez is only 27 and has already won 99 games, which surprised me. He has only won more than 14 games in a season once (19 wins), but he is a workhorse and doesn’t have a lot of injuries and pitches a lot of innings. I would say he has a legitimate shot, except Hernandez pitches for Seattle, which is one of the worst offensive teams in baseball. In fact, over the last five years, Hernandez’ ERA is under 2.90 and he has only won 68 games (13.6 wins a year), pitching for a bad team, and in particular a bad offensive team. In fact, the year Hernandez won the Cy Young, he only went 13-12, with an ERA of 2.27. Will Jeter catch Pete Rose? When Jeter was one of the youngest players to 3,000 hits in 2011, a lot of people talked about him perhaps catching Pete Rose at 4,256. At the time, I thought it was impossible, but then Jeter had a great year last year, hitting 216 hits and putting him at 3,304 hits at the age of 38. I thought he had a valid chance of catching Rose. However, Jeter badly broke his foot last October and will likely be out until May this year, perhaps even June. I think that puts a serious dent in him attempting to catch Rose, because who knows how well he will be able to play when he comes back? Jeter needs about 950 hits to catch Pete Rose. To do that in five years (retiring at the age of 43), he’d have to average 190 hits a year. If he averaged about 155 games a year, he’d have to bat about .317 (190-for-600 average per year). I think that’s impossible, for a guy 41, 42 and 43 years old to average 600 at-bats a year and a .317 average. The 2013 season, I seriously doubt Jeter will reach 500 ABs. 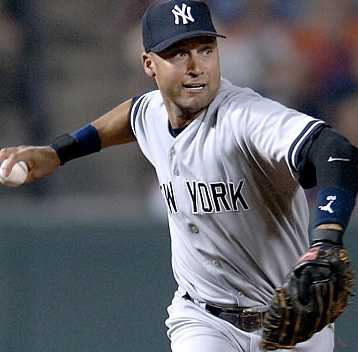 To do it in 6 years (retiring at 44), Jeter would have to average just under 160 hits a year. If he averaged about 145 games a year, he’d have to bat about .286 (160-for-560 AB average per year). Again, that’d be pretty difficult. And this is all assuming that his ankle will be OK. I predict Jeter will reach 4,000 hits, but he will come up a couple of hundred hits short of Pete Rose. To get to 4,000 hits, say Jeter plays another five years. He’d have to average about 140 hits a year, and perhaps a .280 average (averaging about 130 games a year and 500 AB a year). Very, very doable, I believe, if he is healthy. I’ve been having fun making fun of the Scruffy Sox. 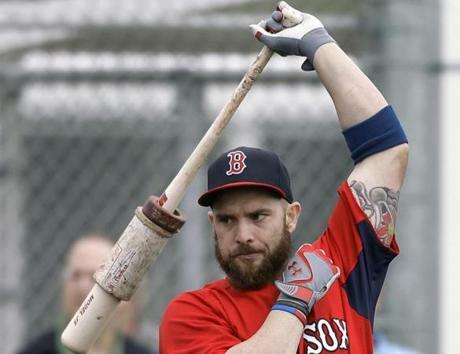 Almost all of their players have beards and even though the Red Sox have a fairly big salary, their team seems to be full of scrappy underachievers. I’ve been told the beards and long hair thing is some tradition that goes back to Bill Lee. No matter how well they do (and who knows, they’ve started 3-1, which is encouraging), they should be fun to watch this year at least, especially considering the miserable season they had in 2012 with bigmouth Bobby Valentine and having to dump bad attitude Josh Beckett. First of all, the Sox seem to have gotten rid of all their jerks. Lackey has a history of being a bit of a jerk, but maybe being a lousy pitcher for two years, then spending another year on the IR has humbled him. I would like to see Jacoby Ellsbury stay with the Sox, but I suspect they will trade him. He and Sox haven’t liked each other for a while, ever since Jacoby broke his ribs in a collision with Adrian Beltre, then left the team to rehab. I’ll cheer for him no matter where he plays! 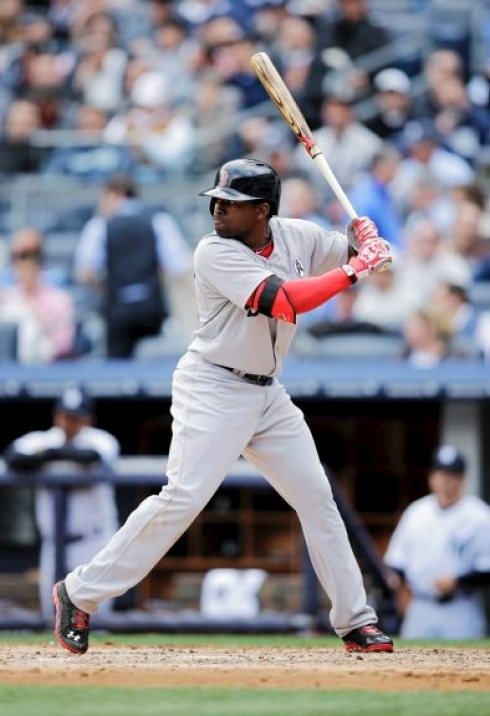 The Sox’s new guys are (and I love this name) Jackie Bradley Jr. It totally sounds like a made-up name. But, he was their best player in spring training and played himself right into the everyday line-up. Remember that name … Jackie Bradley Jr.